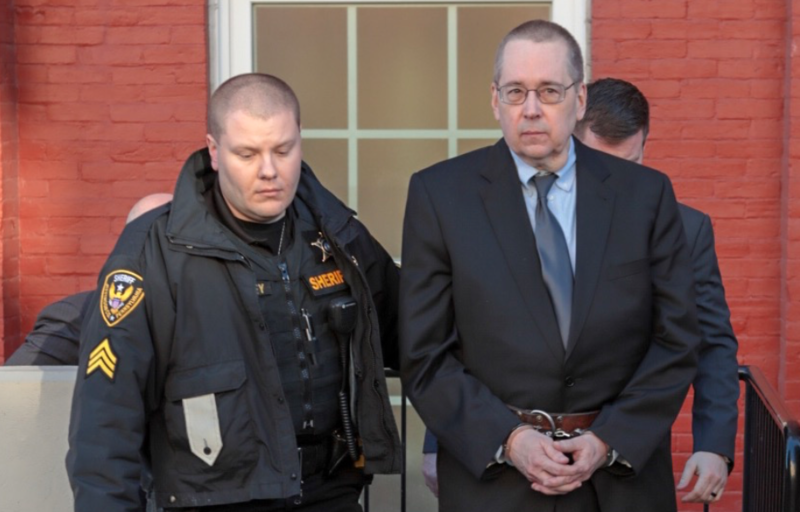 BROOKVILLE, Pa. (EYT) – “Finally, justice was served!” stated Attorney General Josh Shapiro on Friday to a group who were gathered outside the Jefferson County Courtroom following the sentencing of former Fryburg priest, David Poulson. 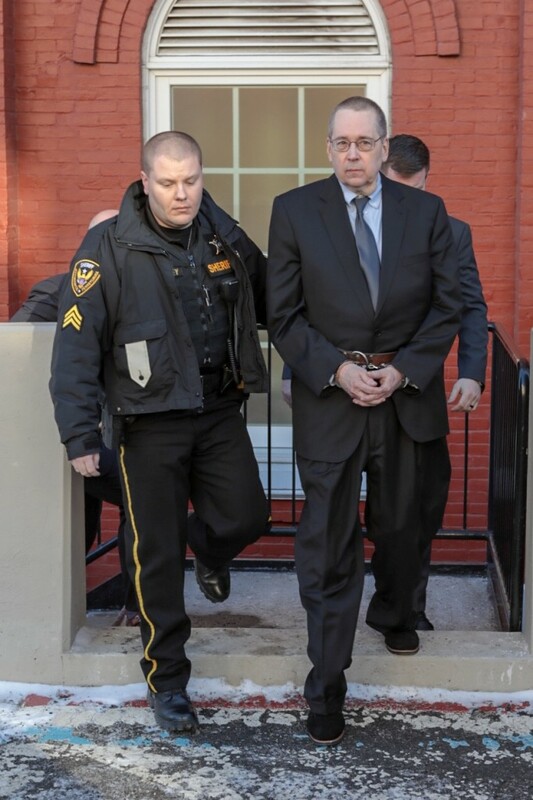 “Poulson weaponized his faith and used the tools of his priesthood to abuse children here in Pennsylvania,” Shapiro said during the press conference following Poulson’s sentencing on Friday afternoon. David Poulson, 65, who pleaded guilty in October to Corruption of Minors and Endangering the Welfare of Children – both felony crimes – addressed the court on Friday afternoon prior to his sentencing. “I know there is nothing I can do that will undo the harm that I caused,” said Poulson. Poulson also stated that he held “no ill will or bad feelings” toward the prosecution, grand jury, the attorney general, or his victims. Jefferson County President Judge John H. Foradora sentenced Poulson to an aggregate sentence of two and a half to 14 years in prison. “Today, finally, finally, justice was served upon David Poulson, a priest who preyed on children for his own sexual gratification,” Shapiro said. Shapiro also noted the significance of Poulson’s sentence, which was the maximum sentence for the charges on which he pleaded guilty. “Understand these are difficult cases. Far too often, predator priests either have not been charged because their enablers manipulate the statute of limitations as church officials cover up their crimes to protect the institution instead of victims,” Shapiro said. Poulson was charged last May by a Statewide Investigating Grand Jury probing widespread sexual abuse by clergy against children in six Catholic dioceses in Pennsylvania, including the Diocese of Erie. – Poulson sexually assaulted one victim repeatedly in church rectories at St. Michael’s Catholic Church in Fryburg and Saint Anthony of Padua Catholic Church in Cambridge Springs. The abuse at the rectories usually happened on Sundays – after the victim served as an altar boy at Mass. 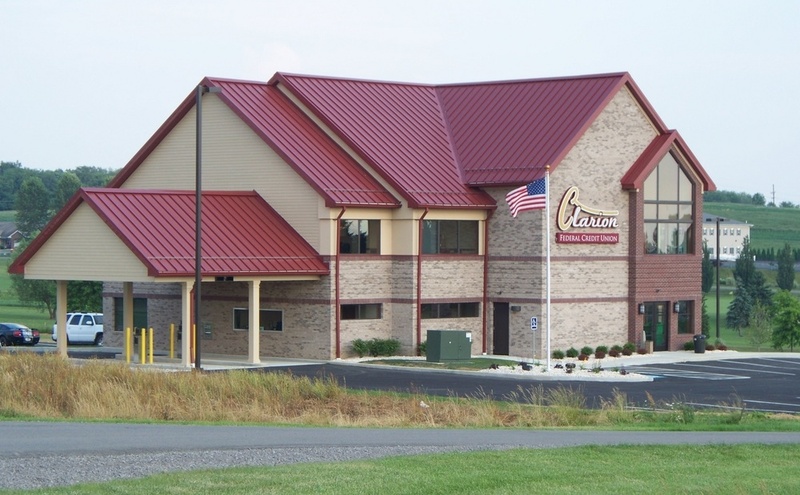 – Poulson also assaulted this victim and attempted to assault a second victim at a remote hunting cabin that he owned with a friend in Jefferson County. In an effort to assault them, Poulson would bring the youths to the cabin and watch horror movies with them on his laptop. Since at least May 2010, the Diocese of Erie under Bishop Donald Trautman knew of Poulson’s predatory tendencies – but did nothing to report him to authorities until September 2016, in response to a subpoena from the grand jury. Trautman himself interviewed Poulson in May 2010, and Poulson admitted to the bishop that he was aroused by boys. Despite knowing of Poulson’s admission, the priest was allowed by the Diocese to remain in ministry until 2018, when he was finally suspended by Bishop Persico. “For more than seven years, the Diocese allowed Poulson to remain a priest, even though they knew he was a predator, they allowed him to stay there as a threat to others,” Shapiro said. Shapiro also shared some of the words of Poulson’s two victims, from the victim statements, which had been shared in the courtroom. “David Poulson affected my life in more ways than I can count. It has cost me my career and my marriage, and my daughter. Because of this man’s actions, I have suffered for years from mental anguish. I ask that true justice be served on this day,” Victim #1 wrote. “I convinced myself that the road trips, gifts, dinners, etc. were just you being that friend. But it was all for an ulterior motive. You used your position as a man of the cloth as a way to manipulate young boys. I trusted you, and in return, you tried to take advantage of that trust,” Victim #2 wrote. “The courage of those two survivors, the courage of the survivors who grace us with their presence today is extraordinary. These survivors, as I’ve said before, are heroes. And so while not every victim of clergy abuse across our Commonwealth was in court today, or represented by those two specific victims, I hope they receive they receive some sense of closure today as victim two hopes,” Shapiro said. According to Shapiro, Friday’s sentencing of Poulson and the sentencing of Father John Sweeney in Westmoreland County last month are two battles won, but far from the end of the war. “The release of the report in August has sparked a movement and a reckoning in this country,” Shapiro said. While the progress fueled by the Grand Jury report in Pennsylvania has been significant, Shapiro’s final message focused less on that progress, and more on steps he believes we still need to make going forward. “While all of this is happening, one action that has not yet happened is the approval by our legislature of the reforms recommended by the grand jury to prevent this type of abuse from ever happening again here in Pennsylvania and to give victims of clergy abuse their day in court,” Shapiro noted. The Grand Jury recommended reforming the criminal and civil statutes of limitations on sexual abuse in Pennsylvania, among four recommendations. Attorney General Josh Shapiro reinforced those recommendations today, calling on the Legislature and Governor Wolf to eliminate the criminal statute of limitations for sexually abusing children, create a “civil window” so older victims could sue for damages, clarify penalties for failing to report child abuse, and specify that civil confidentiality agreements do not cover communications with law enforcement. “I stand with every victim and survivor of child sexual abuse, and continue to support the passage of all four reforms recommended by the Grand Jury,” Shapiro said. According to Shapiro, the current statute of limitations prevented not only charges against more of the priests named in the Grand Jury report, but also charges against those who covered up the abuse. “We ran a statute of limitations test on anyone involved in enabling or covering up that abuse, and again, because of the laws of this commonwealth, we charged, at that time, those who could be charged,” Shapiro said. 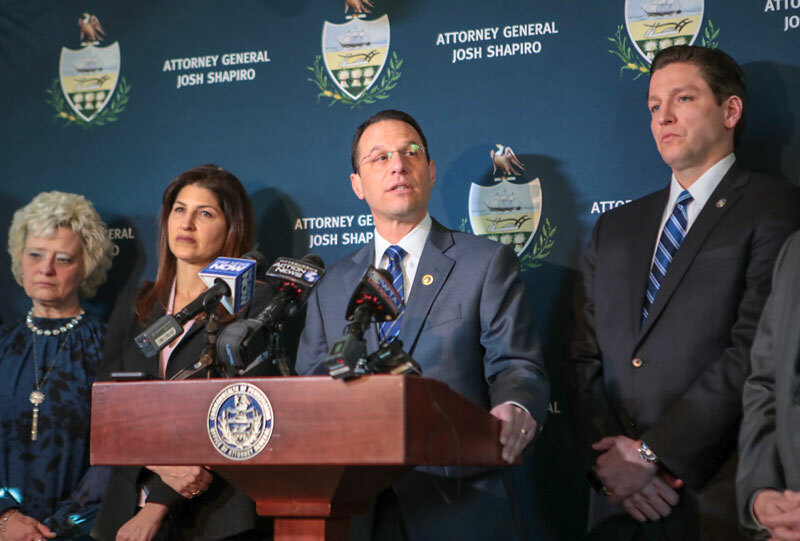 While the reforms the Attorney General and the Grand Jury are recommending may or may not be forthcoming, Shapiro noted that his office plans to continue leading the way in the battle against child sexual abuse in Pennsylvania.